Spencer took a small team of Raytheon engineers and began building prototype machines. These were jerry-rigged out of garbage bins and radar tubes, and were soon covered in exploded eggs and half popped corn. Spencer knew the device had potential, but he saw its limits as more and more foods were tested. The machine heated unevenly, and crisping and browning effects were nearly impossible to achieve. These problems are still a fact of microwave cooking today, but companies have found a way around it through the foil "crisping sleeves" packaged with some microwavable pastries like Hot Pockets. The foil reacts to the microwaves by becoming very hot very quickly, which then creates a "crispy" crust similar to what you'd get out of a regular oven. Radarange's price and size meant that the market for these machines was limited, and they failed to make a profit throughout the 40s and 50s. Counter top models were introduced in 1967, at a still-steep price tag of $495. To add to marketing problems, according to who you believed, the machines could cause impotency, blindness, and radiation poisoning. 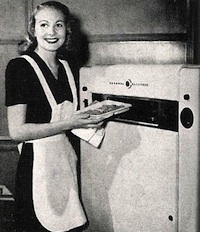 Once prices came down and Americans realized widespread sterility hadn't happened, the microwave oven took off. 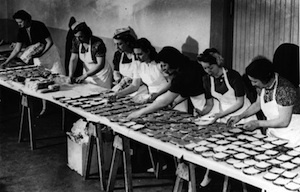 Food luminaries from Julia Child to James Beard rewrote recipes around it. Joan Collins even starred in an amazing television commercial for "the Sanyo food thing" at the height of her Dynasty days. Perhaps it's best to end with a recipe by one of the microwave's greatest enthusiasts. Cookbook author Barbara Kafka literally wrote the book on microwave cooking with her 1987 work Microwave Gourmet (buy it ). Kafka swears by the appliance, especially for cooking vegetables and steamed puddings. Here's a modified recipe for her Steamed Chocolate Pudding, published in the New York Times in 2008. It's half cake, half mousse, but all very good reason to give the lowly microwave a second look. Ice cream or sweetened whipped cream for serving, optional. 1. Use softened butter to grease a 4-cup bowl. Grind chocolate in a food processor, then add cold butter and sugar; process until combined. Add remaining ingredients and process until smooth. 2. Pour into bowl, cover tightly with plastic wrap, and cook on high for 4 to 5 minutes, or until just set. Remove, pierce plastic with tip of a sharp knife, and cover with a heavy plate; let rest for 10 minutes. 3. Unmold onto a serving plate and serve warm or cold, with ice cream or whipped cream if desired. 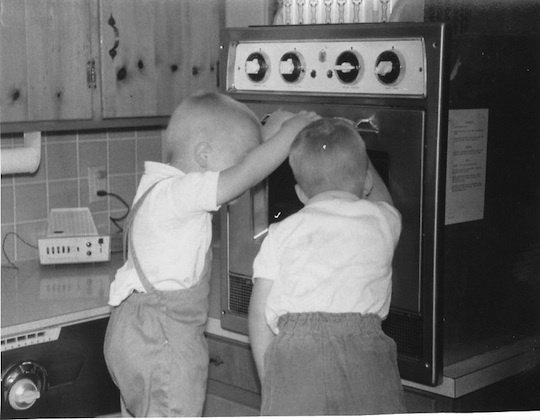 Mark Bittman revisits the microwave in The New York Times. A tech-heavy article on the history of the microwave, written by University of Illinois professor and public radio commentator William Hammack. Marie T. Smith's compendium of microwave cooking for the college student, retiree, busy mom, and you. I wonder about the state of the art for microwave ovens about five years or more before they first started to become popular and affordable,during the early to mid seventies. The Huntsville Alabama Space and Rocket Center used them in their snack bar, and they may have been some of the older larger units that took up a bout a refrigerators footprints, lining the walls like washing machines, with very frightening warnings posted regarding pacemakers. Welcome back, Stephanie! I really enjoyed this article, and I like inclusion of Further Reading. What a wonderful article! I use the microwave frequently and wouldn't know what to do without it (even though my more culinary-inclined friends sometimes make fun of me for it). I do sometimes wonder what effects irradiated food has on the body (and cell phones for that matter), but it's still a useful invention. What about the health risks of the Microwave? There are some pretty convincing arguments against using it... obviously it's not a natural way of heating food. A quick google search for microwave health risks turned up quite a bit, but I wonder if you have any further research to append to your article? We've tried to limit our use, and are debating getting rid of ours alltogether. Microwave radiation is not dangerous unless your microwave's door is broken or you put your pet in it. Don't believe the hype. You think heating food over an open fire is somehow more natural? I would wager you get more contaminants in your food over an open fire, depending in what you're burnign for fuel.